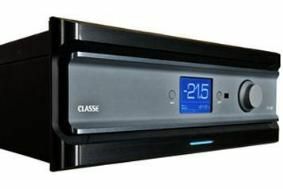 Classé rolls out Custom Theatre Electronics range | What Hi-Fi? This is designed for low thermal mass, giving rapid heating and cooling, and thus faster heat dispersion. The faceplates, made from solid aluminium, has an offset central panel, creating a large hidden vent for the ICTunnel. The CT-SSP ten-channel preamp/processor is the company's SSP-800 in new clothing, and sells for £6950. It offers Dolby TrueHD and DTS-HD Master Audio sources, the digital signal processing running on two Texas Instruments processors operating in 64-bit double precision and using floating point arithmetic for all audio signal calculations. A five-channel power amp, the £7450 CT-5300, is designed to match the processor, with system expansion available using the stereo CT-2300 power amp at £5450 or the CT-M300 monobloc, at £4150. Power output of all of these is 300W per channel. Completing the range, which is on sale now, is the 600W CT-M600 monobloc amp, yours for £5450.